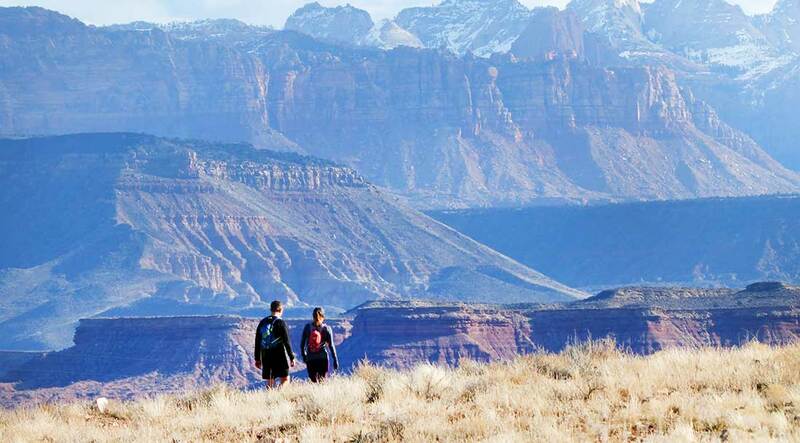 Zion National Park towers on the horizon of southern Utah's trails. I once heard someone say that two horses pulling together can pull more than the sum of the two horses pulling separately. I found the idea intriguing and went to the internet to see if this was true (because of course everything on the Internet is true). It turns out that this is a real thing! Think about that. A horse can pull a certain weight. And another horse can pull a certain weight. But pulling together, the weight they can pull is greater than the sum of those certain weights. Maybe it has to do with intertia and momentum, who knows? We were like a team of horses out on the trail. We ran better together than we would have alone. Although I may not understand how it works, I seriously love how this phenomenon is also alive and well in ultrarunning. We can often accomplish more with others than we can on our own. I was recently reminded of how “the whole is greater than the sum of its parts” in running. Early in the week I ran a 21-mile loop on some of the obscenely beautiful trails on the outskirts of Zion National Park. Toward the end of those 21 miles, I was completely worn out and struggled to keep a decent pace. A few days later, some friends came to town to escape the busy city and get in a long run. So I took our group on this very same loop. While I ran with Cherie, Rick, Catherine, and Kacey, we talked about family and work – and where to buy the best glazed donuts. We talked about the amazing Nutella tortilla Rick made me when I got to the aid station he was working at Antelope Canyon. And what races we want to run in the future. And then there was the laughing. So much laughing that my stomach hurt as Catherine told us about the brilliant idea she had with a friend in high school to open an animal sanctuary. Their first animal to rescue was a goat. The farmer she got the goat from left out a minor detail – the goat was pregnant. And the goat just so happened to have a baby in the back seat of her car when they were driving home. We laughed so hard we couldn’t breathe as we talked about past race experiences together. We have all seen each other through hard times. Times during races when one of us wanted to quit, or when we needed some help to get through a bonk. Although those experiences were difficult in the moment, we look back on those ugly times as our fondest memories. And then there was the scenery. The scenery! Living in southern Utah, I am fortunate to be utterly engulfed in beauty. I enjoyed showing them some of my favorite view points, and introducing them to trails I have fallen in love with during the thousands of miles we’ve spent together. And suddenly we were done with that 21-mile loop! I felt much differently than I felt after running the loop solo a few days earlier. I felt energized. We ran the loop faster than I ran it solo and I felt better at the end. After that loop we decided to keep running. I introduced them to other incredible trails with jaw-dropping views. When all was said and done, we ended up with 30 miles (and a perfectly valid justification to buy a few glazed donuts). We were like a team of horses out on the trail. We ran better together than we would have alone. It was another reminder of how running with others can make us better athletes. Running can be faster and feel easier physically, and the very act of being with others on a run can also be a boost psychologically. As much as I love solo runs, sharing some miles with friends is good for my running soul.